In this remarkable tale of hope and survival, Hannah Luce tells how, as the sole survivor of a terrible plane crash, she came to grips with her faith: “a calamitous, fascinating memoir, written with surprising spiritual sophistication” (Publishers Weekly, starred review). On May 11, 2012, a small plane carrying five young adults, en route to a Christian youth rally, crashed in a Kansas field, skidding 200 yards before hitting a tree and bursting into flames. Only two survived the crash: ex-marine Austin Anderson, who would die the next morning from extensive burns, and his friend Hannah Luce, the daughter of Teen Mania founder and influential youth minister Ron Luce. 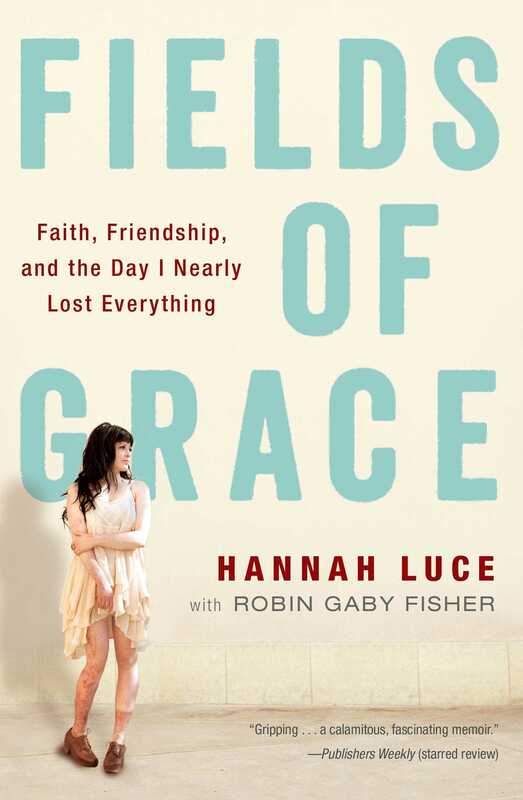 In Fields of Grace, Hannah details the investigation of her faith, her coming-of-age as the dutiful daughter of Evangelical royalty, her decision to join her father’s ministry outreach to teens, and her miraculous survival and recovery following the accident. It also serves as a tribute and testament to the lives of the dear friends who perished in the catastrophic plane crash and reveals how their memory continues to inspire all that she does. Here is the “riveting personal account” (Booklist) of a girl who grew up as the daughter of one of the most influential evangelical leaders of our time, who questioned her early religious convictions somewhere along the way and who, from the embers of that doomed plane ride, finally found her faith. The closer one gets to realizing his Personal Legend, the more that Personal Legend becomes his true reason for being. The late November sun sinks low on the horizon as I make my way toward the mown cornfield in southwest Kansas, back to the worst day of my life. My backpack is stuffed with a warm blanket, a lavender-scented candle, and a book of matches. I plan to stay awhile, once I get where I’m going. I am still recovering from my injuries, so my movements are slow and shaky, but I am in no rush to beat the dark. This is something I must do. The first time I was in this rural corner of Middle America was six months ago, in mid-May. It was planting season, and the terrain was lush with burgeoning crops. I remember the spinning fields of green as our plane plunged, sadistically slowly, but stubbornly and ferociously, toward the earth below. Anything I had hoped to see was lost in those spinning fields. I couldn’t make out a house or a barn, nor a river or a lake. Not a tractor, or a car, or even a road that looked traveled enough to lead somewhere else. I know all of this because, as the plane was dropping out of the sky, I was already planning my survival, even though I was prepared to die. As hard as I try to forget, I remember every detail from that hellish day. The first signs that our plane was in trouble. The desperate efforts by the boys to try to save us. The resignation I saw in their eyes when the outcome became obvious. (Was it resignation? Or faith?) Searching the faces of my dear friends as we hurtled toward a certain, terrible death. Last words. Lord have mercy. Christ have mercy. In the name of the Father, the Son, and the Holy Spirit. The cornfield is in the middle of nowhere, off a gravel lane that you’d never know was there unless you lived in these parts, or happened upon it for some reason, as I did. I’ve come here, I think, looking for forgiveness for surviving the crash when everyone else died. I know that I must have mercy on myself before I can begin to seek the kind of purposeful life that my friends deserved. So far, all I have felt is the torrid guilt of being alive when my friends are dead, and the acid torment of my thoughts. Sometimes, when I’m in the shower, I claw at my scars, hoping to erase my memories of that tragic day. But I will never forget. My scars are a constant reminder. I haven’t slept through the night since the crash. Every time I close my eyes I wake up screaming just before the plane slams into the earth. That’s when the real torture begins, as I thrash around in my bed with all of the lights in my room turned to bright, afraid to close my eyes again, resisting ghastly flashbacks as I try to make sense of something that will never make any sense. Five people were aboard that plane, all of us friends from Oral Roberts University, everyone giddy about traveling to a Christian youth conference hosted by my father, the leader of one of the largest evangelical Christian youth ministries in the world. Two of those people, Austin Anderson and Garrett Coble, were my closest friends, and I deeply cared for Garrett, although I never got to tell him so. I met Austin first, shortly after the start of the fall semester at ORU in 2009. He had recently returned from his second tour of duty in Iraq, and he was studying business. We started talking one day, and soon we were stealing away to a spot beneath the Forty-first Street Bridge in Tulsa where we’d sit by the river, puffing cigars and planning our futures. Austin was a poster boy for the Marines. He was tall and fit, with a blond crew cut and the rough edges of a country boy. He told me stories from the war, and the conflicts he felt about fighting it, and I helped him to explore the struggles with faith that so often result from witnessing the profane effects of combat. He said he liked me because I didn’t fit the typical stereotype of the ORU girl, whom he described as someone who drove Daddy’s yellow Mustang and majored in finding a husband. I aspired not to be that girl, much to the chagrin of my fundamentalist Christian parents. I was a bit of a rebel, a “free thinker” trapped in what I saw as a culture of closed minds. When I wasn’t studying church history in the college library, I took long walks alone in the avant-garde neighborhoods of Tulsa, stopping in old bookshops to browse for rare books on things like herbs and witches, or ducking into hookah bars to sit at communal tables and share water pipes of shisha with strangers. Garrett taught marketing at ORU while he was studying for his Ph.D. in business administration at Oklahoma State University. I’d heard his name because he was popular with the students, but we had never met. Finally, one day, he tagged along with Austin for lunch at our favorite rib place. I thought he was fascinating, if a bit fussy and impatient. Garrett was seven years older than me, and he’d been on Christian mission trips around the world, often with my dad’s ministry, as I had, although we’d never crossed paths during that time. We shared a love for travel and an unquenchable thirst for knowledge, but our compatibility pretty much ended there. I’ll never forget the first time I looked in his closet. He had the exact same golf shirt in every color. He was clean-cut and conservative. I loved red lipstick and Bob Dylan. I think, for his part, Garrett was drawn to me, at least initially, because of who my father was: the rock star of charismatic Christian teen ministries. As it turned out, he’d attended my father’s Christian boot camp with his church group more than a dozen times when he was in his teens, and he said it changed the course of his life. I used to tease him that he had a man crush on Papa. Our relationship took twists and turns between friendship and romance that first year; we were so drawn to one another, it couldn’t be helped. He was the first to initiate any real closeness between us, always inviting me for walks through the park on Riverside, near the university, or hot-tubbing at his house nearby. He had a kind of dorky charm that I was attracted to, which I couldn’t even admit to myself. We often cuddled and nuzzled and kissed. Stuff like that. But we were in different places in our lives. He was ready to settle down and have a family. I was a free spirit on the verge of many adventures I had planned for my future. Garrett and Austin were country boys at heart. They both grew up in small Oklahoma towns, in families with strong Christian values. While I did just about anything to distance myself from what I saw as my oppressive religious background, they were looking for ways to put their faith to work. In fact, that was the purpose of our flight to Council Bluffs, Iowa, on that fateful day in May. They were working with my father’s ministry, pitching in to help save a generation of young Christians. I was going to get closer to my dad, to try to atone for the disappointment he felt in me for straying from my faith. I was rudderless and searching for my spirituality, and they couldn’t wait to get out there and do their part to change the world. I’ll always cherish the photos from our last day together, taken moments before the plane took off. I wanted to document the beginning of our big adventure. There we are, crunched together in the back of the Cessna, the boys in their golf shirts and khakis, me in my big, red sunglasses. I held out my camera and pursed my lips like a supermodel. C’mon, boys! Smile! I didn’t need to tell them. They woke up smiling. Austin and Garrett had so much promise and so many grand intentions. So why were they taken so young, before they had a chance to realize their dreams? Why did I live and they die? I have asked myself those very questions relentlessly over the last few months. When the answers don’t come, and I’m fraught with angst, I sometimes seek comfort in the airplane-sized bottles of rum and gin that I keep close, but no one knows that, certainly not my parents. Even when I do take something to try to numb my thoughts, the respite from feelings of guilt and remorse are fleeting. I have felt hopelessly alone in my grief. When I’ve been at my wits’ end, I’ve tried turning to my mother and Papa for, what? Absolution for surviving? Salvation from my dark thoughts? Every time I do, they look at me with expressions of helplessness—and, sometimes, I think, exasperation—then tell me to “give it to Jesus.” If only it were that easy. The field where we crashed is vast, with random clumps of oak and ash trees. I’m not sure of the exact spot where the plane hit, and there’s a lot of space to cover, but I have asked to take this trip alone because it is too awfully personal to share. Making my way through shorn stalks of corn, I am guided only by my instincts and the light of the rising, full moon. I am a diminutive girl—five feet two inches, and a hundred pounds last I checked—a mere speck in the wide-open landscape that is rolled out before me, yet rather than feeling lost or overwhelmed, I feel strangely content, the way I do when I wrap myself in the ratty black sweater I keep in my bottom dresser drawer back home, for those chilly nights when nothing else can warm me. This is the place that changed my life and challenged who I was—a rebellious and rather cynical girl who questioned everything about her staunch Christian upbringing, even the existence of God. I’m not that person anymore, I’m sure of it, but I don’t know who the postcrash Hannah is. My hope is that I might find some answers in this lonely stretch of rural cropland. Only then can I begin to live again. The walk through the field is longer than I remember. Except for the crunch of my steps on the leftover corn stalks from the fall harvest, it is as quiet as death. Against my will, my memory fills the silence with the frenzied drone of an airplane in trouble, and I’m transported back to that day and falling from the sky. I freeze in my tracks, but something—what is it? a hand on my back?—pushes me gently forward. Tentative but determined, I press on. A few minutes pass, and I know I am close to the crash site because the energy around me has come alive. My skin prickles with anticipation. It reminds me of the tingly feeling you get when you’re at the airport, awaiting the arrival of a boy you really like. You know his flight has landed and he’s there, somewhere, in the terminal. You just don’t see him. I walk a few steps farther, wondering what will come next, how far I still have to go. That’s when I see it, what looks like a pool of shimmering stars. I pull the pocket flashlight from my backpack and shine it on the spot. My heart skips and jumps. A few feet in front of me, scattered around a towering red oak, is what has to be a million bits of metal, reflecting the light from the full moon. That’s all that’s left of our plane, these tiny pieces of shiny metal. I pick up a handful and tuck them into my bag for safekeeping. They feel like treasure, the last vestiges of my precious friendships. The oak tree looms over me like a pair of protective arms. Its trunk is scorched and its limbs are twisted and bowed. This is where the plane stopped after it slammed into the ground and careened wildly out of control. I remember seeing it when I was draped over Garrett’s lifeless body, half in the plane, half out, trying to free myself from the burning cabin. At first I am stunned, but then lyrics my sister, Charity, wrote for me, in an attempt to lift my sagging spirits, spring to mind. I begin to sing. A chorus of coyotes’ howls drowns out my puny voice. The pack can’t be more than a few feet away, but it’s too dark for me to see. Their howling turns to what sounds like raucous laughter. I grew up in the flatlands of rural eastern Texas, and I know that means they’re trying to intimidate me, the trespasser, force me to leave their haunt, but I am undaunted. I belong here, too. This is where I need to be. God, how I’ve missed you both. The air is noticeably colder, and I fold the blanket over my legs. “Austin, I’m sorry I couldn’t save you. Thank you for taking care of me. I wish I could have taken your place on that plane, and I hate constantly reliving your suffering. I feel so weak. If only I had your courage, your purpose. I get so angry when people tell me I was saved for a reason. What reason? Why did I have the audacity to survive? Why me instead of you? You had more faith than I did. “Garrett, I wish I’d loved you better. Thank you for loving me. I don’t have your strength or your fierce determination. You were a rock for me. What am I supposed to do now that you’re not here? I don’t even know how to live without suffering anymore. Part of me doesn’t want to stop suffering because I’m afraid if I do, a piece of you will be gone. The other part of me can’t live with this kind of pain much longer. Their answers don’t come in the way of physical voices, but I can still hear them. It’s as if their thoughts are being placed in my head. We’re happy, Hannah. Really happy. We’re where we want to be. We know we encouraged you, supported you, enriched your life. But some things you need to discover on your own. You need to be able to figure things out for yourself. You can mourn, and we love that you do, but you can’t mourn forever. You have to dance. I think about the lyrics of my sister’s song. I’ll try, I say. For you. And for me.